Are you facing difficulties in making copy paste work from a local computer to a remote computer when using Remote Desktop Client (RDP)? Read this article to find the solution to the copy paste and clipboard issues in remote desktop connections. I am using a Windows 7 laptop and frequently log in to my remote server running Windows 2008. I connect to local drives from the remote server to copy big files from local computer to the remote server. Sometimes I need to copy paste text using clipboard to remote computer. Copy pasting works pretty well from my desktop or laptop to the server without any problems, if you are using recent versions of remote desktop. However, once in a while I get a problem with the clipboard sharing with the remote computer. If I copy some text from the local computer in the clipboard and try to paste it in the remote computer using Remote Desktop, it will not paste anything. It shows that there is no text in the clipboard. How to solve copy paste not working issue in Remote Desktop? 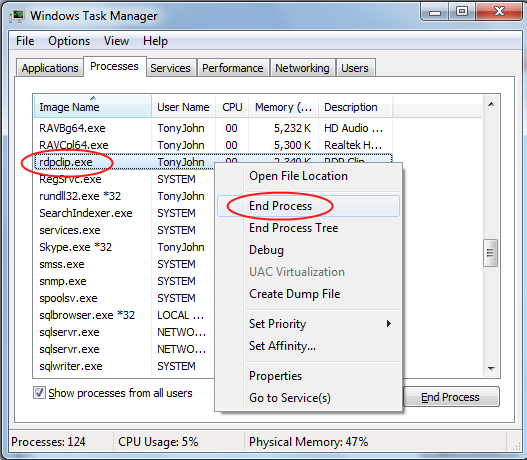 The clipboard sharing is handled using a small application running on the remote machine, called "RDPCLIP.EXE". If this application fails to do the job, your clipboard sharing will stop working and you will not be able to copy paste text, data or files from local computer to remote server using remote desktop connection. 4. Locate a program called "rdpclip.exe"
6. Click on "File" menu in the task manager and select "New Task (Run)"
7. Type rdpclip.exe and press the button to start the process. By killing existing instance of the rdpclip.exe and restarting the program, you can get your copy paste work again in your remote desktop. If the above steps do not resolve the copy paste and clipboard not working in remote desktop problem, please post your comments below. We can explore other options to resolve this. In my case, the above simple steps solved the problem and I am able to use copy paste as usual. Microsoft Launches Remote Desktop App With Windows 8.1 for iOS and Android for accessing and managing all your remote connections in the most efficient and simple manner. In this article we would be reviewing some best softwares for Mac and PC that enable you to access files and folders from PC to PC, Mac to Mac, Mac to PC or PC to Mac. Read the complete review of a cloud based remote access device named PocketCloud Remote RDP / VNC. Know the features, installation steps and the review of this app. Know what all it has to offer to satisfy your remote access requirements. This article gives you almost all ideas you need to have to use Utorrent efficiently. Moreover, it teaches you the difference between Seeds and Peers and much more. This is an article on the latest version of one of the best free collaboration software, Teamviewer which enables remote control on any PC, Mac, Laptop and Mobile devices where you can access either to any single application or the entire system. I am facing the same problem recently when I try to connect to my other desktop at home through the team viewer application. The problem is that the copy/paste doesn't work on the remote system too when connected through the application and works when disconnected. I have tried almost most of the tips but nothing seems to be working for me. Please let me know if you have a solution to this. The remote desktop has Windows 7 on it. As per suggestion we have tried to kill rdpclip.exe and launched it back but still we are facing the issue. We have tried on may computers but did not work. Please any other option . You can run the following commands on your remote machine one by one. This is a temporary fix, alternately you can use an online copy paste toil, its great. This is a temporary fix, alternately you can use an online copy paste tool, its great. This will solve your copy/paste clipboard problem, you can also use www.letscopypaste.com an online copy paste tool, easy to use and fast. I tried killing RDPCLIP and restarting it but still it does not work. My local workstation has Win7 Pro 64 bit and I am RDPing to 'Win Server 2008 R2 Standard with SP1'. It used to work earlier but somehow it stopped after reboot of last windows update on Nov 7, 2012. Thanks a lot, this solved my issue; great help. Thanks a lot. It resolved my problem. Thank you very much. It resolved my problem. Excellent, thanks for that! Worked perfectly for me. I know this trick works. However this happens to me and my work colleagues on a regular basis on various servers. Does anyone know what the possible causes for the rdpclip process to stop working properly could be? Just restarting the rdpclip.exe process helped. 1. Start Remote Desktop Session Host Configuration (tsconfig.msc), go to the properties of the RDP-Tcp session and on the Client Settings tab make sure that Clipboard Redirection is unchecked. You will need to disconnect and reconnect for the change to take effect. You may still need to kill/restart rdpclip.exe. 2. Go to the Group Policy Management Console. In \Computer Configuration\Policies\Administrative Templates\Windows Components\Terminal Services\Terminal Server\Device and Resource Redirection and make sure that the "Do not allow Clipboard redirection" setting is Disabled. REF: "Device and Resource Redirection" on MSDN. Thank you so much. This has been annoying me for quite a while. removing rdpclip process totally works. As per suggestion we have tried to kill rdpclip.exe and launched it back. I am using remote desktop RDC 2.1.1 for Mac and I am connecting to a Windows 7 machine. THe connection works fine but I cannot make copy/paste work. Before when I was connecting to the host machine with another Windows 7 machine copy/paste worked fine. I tried stopping and starting rdcclip.exe but no luck. Any ideas would be really helpful. The tsconfig.msc comment worked for me. Nothing else was working. The clipboard was not disabled (check box was not there) but checked the box to disable it. Hit apply, then unchecked it and hit apply again. Working fine now. After a lot of research, I noticed that my paste issue only occurred when I had my browser running. It transpired, that is was when any browser (Firefox, Safari, IE, etc) was running. Long story short, it was my Webroot security software blocking some of my programs which were attempting to read the Clipboard. It makes sense, I have a browser open so I wouldn't want an untrusted application gaining access to my clipboard as it may contain a password. I just hadn't realized that it was doing this. When I disabled the Protect Clipboard Data option, everything worked again. Webroot prompted me to disallow / allow a particular program to access the clipboard, with an option to remember my choice. So, I gave certain programs permission and then switched the protection option back on, as I think that it is a great feature. I would guess that other security suites use this methodology so if you are experiencing paste issues, you may find it beneficial to check your security suites settings. Thanks a lot. This solved my issue on using the Remote desktop of win7 from winblue system. Thank u so very much!!!! It resolved the issue. It worked for me. Thanks a lot. Worked for me. Thanks much for posting this. Above mentioned solution is not working. Can any one can share solution for the issue "copy paste not working from remote desktop to local in windows server 2003"
thank u for your post. I have done it correctly. This solution is not useful on Windows 8.1, as I am not able to copy paste while connect RDP to Windows 8.1 machine. Please help me if any one know about this. In some cases nothing will work except rebooting the server at fault. Some times it isn't an option so you'll have restort to save the information to files to transport back and forth. This is one of the world oldest bugs still at large. Almost 2 decades old. Few years ago I found information that Microsoft has no intentions to fix this bug. It has to do with some kind of resource limitation or leaks. There are several data structures that haven't changed since the beginning of RDP, when memory was expensive en every free KB mattered. Some of the cause problems in high resolutions and when you have loaded Remote Desktop Servers. No bug has cost my more wasted hours the last 15 years, it's in the hundreds. Its perfectly working and simply superb the explanation. Remote to a VM: shared cliboard works. Remote to a physical PC: shared clipboard doesn't work. It is working. It worked when I checked the Administrator privileges box. Thanks for this informative article. Solved the issue. It worked. Thanks a lot. Thank you. The instructions worked for me! It Worked. Thanks for you instructions. It is working for me by killing rdpclip.exe process in remote desktop.